For many homeowners, a kitchen is more than just for a cooking and dining experience. That said, it is only understandable if you are amongst the many who long for a stunning and efficient kitchen, no matter how big or limited a space you have in your home. Utilising LED light bulbs can provide you with a wide range of colour options and allow you to adjust the light levels for your kitchen to match your mood. Place them in different areas around your kitchen to give the whole space a mesmerising, yet calming appeal. Quartz is made using actual stone, so it reflects the natural appeal of materials such as granite or marble and is manufactured to make it robust, nonporous and colour-customisable. This is the reason why this countertop option is considered a designer’s dream to work with. Whilst kitchen storage is often a tricky subject that can make you feel like you’re stuck with regular old shelves and drawers, opting for flexible storage solutions such as a pull-out pantry system and a single or double height drawer is by far a more convenient choice that can offer you multiple possibilities, no matter what the size of your kitchen. A sink that is 10 inches deep or more provides a practical ease of use. This includes being able to fit a large pot fully inside the sink for filling or cleaning or leaving an item or two in the sink without being visible from a few feet. With today’s ever-advancing technology, smart-home trends are also on the rise in the kitchen. One example is to incorporate a hands-free tap to your next project as it provides better accessibility for both adults who often have messy hands and for children who cannot reach the handle. Choose Hill Farm Furniture today and make your dreams come true. 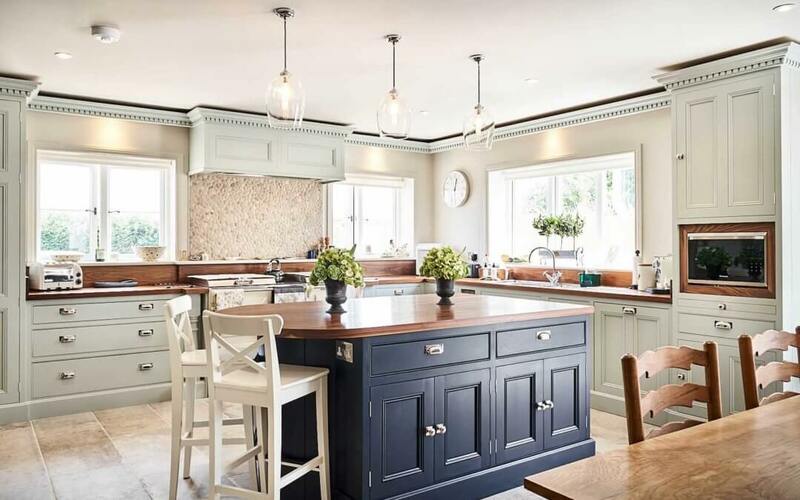 We are a family-run business with 30 years of experience, specialising in kitchen design and furniture to enhance your home. We understand that you would want something unique as you are so give us a call on 01636 626 063 or email us on enquiries@hillfarmfurniture.co.uk to discuss your project with us.